The Darien High School football team hoists their winning trophy from the Turkey Bowl high school football game at Dunning Stadium in New Canaan, Conn. Thursday, Nov. 24, 2016. 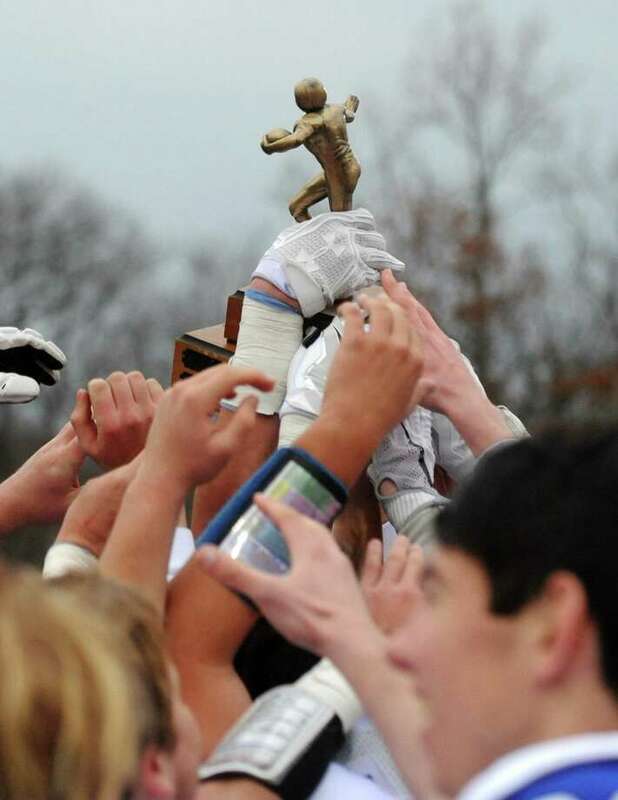 NEW CANAAN — The rivalry between New Canaan and Darien is legendary. However, the rivalry was mostly limited to sports — until now. Carrie Bernier, the executive director the Community Fund of Darien, and Lauren Patterson, president and CEO of the New Canaan Community Foundation, decided to harness this competitive spirit to the benefit of their organizations. On Nov. 28, the two charitable organizations are holding a competition for “most generous town” to see who can get the most donations. The competition is being held on what’s known as “Giving Tuesday,” the Tuesday after Thanksgiving which is designated as a way for people to give back to their community following the surge of holiday shopping that usually occurs the weekend prior. The holiday has picked up momentum (and with the Community Fund of Darien having participated in Giving Tuesday events in the past) and the towns hoped to take advantage of the goodwill around this time of year. Bernier approached the New Canaan Community Foundation with the idea, in hopes the competition could become synonymous with the famous Turkey Bowl football game that occurs between the town each Thanksgiving. The idea came from the legendary game itself and to ride out the competitive spirit into the next week. The groups advertised the competition with an ad in the Turkey Bowl program and are doing a push on social media as well to get people to participate. The winner, announced Wednesday morning, will get a faux gold turkey trophy that will remain in the office for the year. Residents can participate in the competition by going to their respective organization’s website and donating there. Results can also be tracked on the websites throughout the day. Patterson said giving to local community organizations is particularly pertinent as many have seen parts of their funding cut under the new state budget. The New Canaan Community Foundation, which has not participated in Giving Tuesday before, has a group of anonymous donors matching all donations to fill the gap. This donation matching, which applies to new donations and increases in regular donations, will also count toward donations in the Giving Tuesday competition.